How Healthy Is the Eaton Collection? The estate of Jay Kay Klein has donated $3.5 million to the Eaton Collection of Science Fiction and Fantasy announced UC Riverside officials on August 28. It is the largest gift ever received by the UCR library and ranks among the top 25 donations campuswide. Klein contributed his photo collection of 66,000 images of sf fandom and authors to the Eaton Collection prior to his death in 2012. The photo collection was valued at $1.4 million. 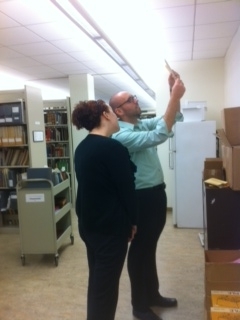 Two Eaton archivists studying photos in a shipment from Jay Kay Klein. Photo by John Hertz. These gifts are credited to the relationship he established with Melissa Conway, the library’s special collections director. I’m sad to have to report that new library administration doesn’t seem to appreciate the value of the Eaton Collection or the expertise that goes into it. Since spring of this year, their accomplishments have included driving out staff members and pushing changes to collection policies that would reduce the Eaton’s holdings, its value to researchers and as a repository of our community’s history, and its standing as a world-class archive. Meetings with the staff of the Eaton have been productive, collegial gatherings. Meetings to negotiate with the new library administration, not so much. It’s putting the faculty of the research cluster in the alarming position of having to protect the very collection we’re charged with fostering. We’re dealing with the new library admins’ efforts to split up the collection and change priorities for what to collect (eg, e-text over print) without consulting scholars in the field, and with what we’d characterize as harassment of staff, who’ve demonstrated extreme competence over the years. “At this meeting we were apprised of recent, potentially positive news emanating from the library dean involving plans to establish a “focused Eaton unit” with two full-time staff positions. There has also been movement toward creating an advisory body composed of faculty and administrators from both our college and the library whose charge would be to oversee the Eaton. We are cautiously optimistic about these initiatives and hope that they will lead to an enhancement, rather than a diminishment, of the value of the Collection. Hopkinson and Latham wrote their comments before Klein’s bequest was announced. One can only speculate whether it helped thaw the attitudes they’ve been contending against. This entry was posted in Sercon and tagged Eaton Collection, Jay Kay, Melissa Conway, Nalo Hopkinson, Rob Latham by Mike Glyer. Bookmark the permalink. I am curious if that is a valuation of his negatives and other materials, or a cash contribution. Apparently this was a monetary donation, separate from the value of the photos. Of course we all knew of JK’s donation a year ago; just didn’t mention it in public. But I do wonder if the new University Librarian, whom I met with Dave Hartwell, is really being honest in this. I suspect he has an agenda hostile to sf, but am willing to learn otherwise. He seems to be targeting some members of the Eaton staff, which does not bode well. Of course the Eaton is unique. But the new regulations the new University Librarian has imposed on research methods, donations, etc do not promise. Gregory: Since everyone knew about it a year ago there is no basis for me to speculate that attitude changes hinted in Hopkinson’s follow-up post are related to the announcement about the money.